1452 Calle America - Santurce. 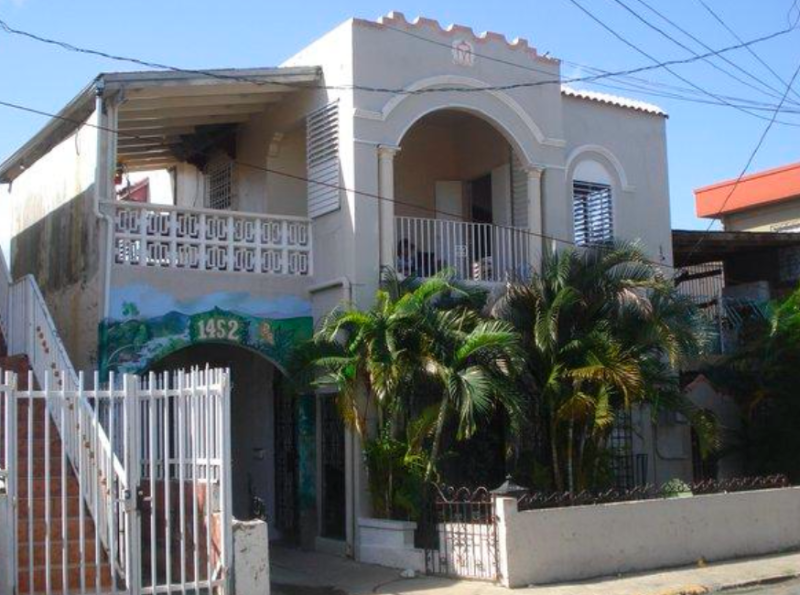 The last 'undiscovered' neighborhood in Santurce. Residents love the neighborhood feeling with most homes owner-occupied. They love their 'hidden secret' location just 3 blocks from Bellas Artes, Pavia Hospital or Doctors' Hospital. The area keeps getting better - now that Walmart and Walgreens have opened at stop 18 - only a few minutes walk away. While most people aren't familiar with the neighborhood - this was the location of the old race track in San Juan with the entrance via Calle Hipodromo. When they moved the race tracks out to Hato Rey in the 1920's, the track was divided into building lots and sample homes were built to show customers various options for their future homes. You'll see that this house and several others in the neighborhood have a 'horseshoe' emblem in the front peak of the house - these were the model homes. This house was one of the original model homes so the lot size is larger than most in the area and the style is typical 'between the wars' elegance with terrazo floors and some original detail. The owner bought this property to renovate as a single-family/professional office combination - but the tenants begged him to let them stay so he used another property nearby for his own home and office. Currently fully rented with stable, long-term tenants. Can be delivered vacant or tenants willing to remain. Ground floor apartment has 3 bedrooms, 1 bathroom, living room, dining room and kitchen. Back yard is ready to be tiled as terrace with 'cantina' kitchen/BBQ area. Ground floor 'casita' has 1 bedroom, small living room, bathroom - could be combined with first floor. Second floor apartment has 3 bedrooms, 2 bathrooms, living room, dining room and kitchen plus large front balcony looking toward Minillas Center, Bellas Artes and Iglesia Sagrado Corazon.